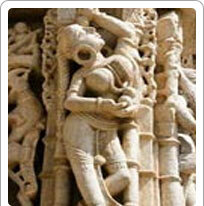 Among the various excursions around Ranakpur, Sadri is situated a mere eight km away, about ten minutes in travel time. It is known for The Varahavtar Temple (dedicated to the Crocodile incarnation of Lord Vishnu, it is a Hindu temple) and the Chintamani Parasvanath Temple (a Jain temple), both magnificent examples of ancient architecture. While here, also visit the Dargah (tomb) of Khudabaksh Baba.